As part of the Aitkin School District #01 the Aitkin Children’s Center is conveniently located on the south side of Rippleside Elementary School. 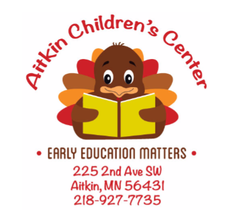 During the school year the Aitkin Children’s Center offers high quality early childhood programs for infants, toddlers, preschoolers, and their families. Research has shown that high quality early childhood programs, such as those offered by the Center, have a positive impact on a child’s social and emotional development as well as their overall cognitive development. 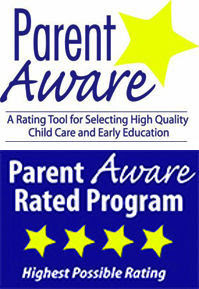 This impact extends beyond preschool and into the early elementary grades. Children's Center Notifications If you have not already done so, Sign up to receive text messages from the Aitkin Children's Center!! It's quick and easy and the fastest way to keep in the know about whats going on at the Center. Text the message @aitkinch to the number 81010 to start receiving messages. To stay in the know about Aitkin Children’s Center events and activities, find us on Facebook!